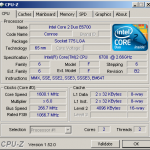 The next release of CPU-Z, developed by CPUID, has raised some eyebrows. One of the most noticeable change is the revised dialog size to fit the new Intel logos. In addition, a new validation button is added to the application, as well as a new tab named “Graphics”, which is intended to provide reports on some basic information about the graphic devices. Furthermore, CPU-Z will also be available in a native x64 version. * New design with “Graphics” tab. * NVIDIA nForce 980a chipset support. * Intel Core i5 and Core i3 processors. 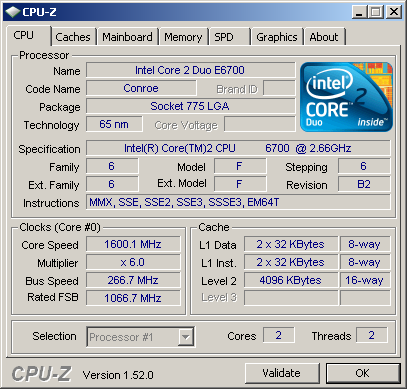 * Intel Atom Z530, Pentium DC E6300 (2.8GHz) and Core 2 Solo processors. * Intel P55 and US15W chipsets preliminary support. * AMD Phenom TWKR support. * AMD Phenom X2 “Callisto” and Athlon X2 “Regor” processors. * AMD Opteron 6-core “Istanbul” processor. * Improved support for Windows 7. This entry was posted on Friday, August 28th, 2009 at 12:37 am and is filed under Fun Stuff, Graphics, Site News, Utilities, Windows . You can follow any responses to this entry through the RSS 2.0 feed. You can leave a response, or trackback from your own site.